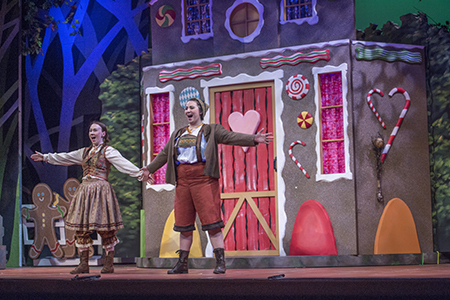 Engelbert Humperdinck’s Hansel and Gretel by the Cleveland Institute of Music Opera Theater at Kulas Hall sparkled. An excellent cast, David Bamberger’s fine direction and blocking, David Brooks’ beautiful sets and effective scene changes, Harry Davidson’s expeditious control of the full orchestra and balance with the singers, and Inda Blatch-Geib’s imaginative costumes, all combined to create a beautifully flowing production whose energy never flagged. Mezzo-soprano Meg Linebaugh absolutely scintillated as Hansel. Her rich, pearly timbre helped make the pants role come alive, and her gestures and stage movements were powerful and convincing. 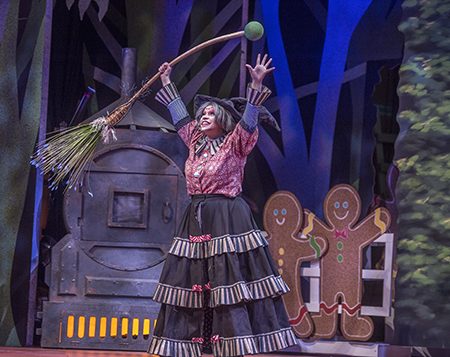 As Gretel, soprano Anne Carruthers’ sweet voice and youthful tone contrasted nicely with Hansel. The two protagonists showed strong chemistry, and their dance movements were spontaneous and natural. Humperdinck’s orchestration is masterful. The horn section opens the opera, and plays a uniquely important role throughout. In the orchestral prelude to Act 1, the strings gradually join the horns in the reflective opening theme. The principal trumpet and horn exchange phrases for the second theme, and soon the texture grows with the addition of flutes and other woodwinds. Soprano Emily S. Brown shone as Gertrude, the children’s mother. Baritone Matthew Brennan, as Peter the father, entered from the rear of the auditorium in good cheer, bringing an array of food, having sold all his brooms to farmers outside the forest. When Peter hears that Gertrude has sent the children deep into the forest to pick strawberries, he expresses alarm because the evil Witch lives there. Lively solos in string bass and bassoon beautifully depict his description of her riding a broom. This production followed the tradition of connecting Acts 1 and 2 by darkening the stage and having the set changes made quickly. The opening of the second act is an interlude, the music gradually growing in ascending sequences led by flutes and piccolos. Scene 2 introduced soprano Kaylee Norris as the Sandman. She sang her graceful aria as angels covered the sleeping children, accompanied by horn and harp in pulsating eighth notes. The texture thickened into a slower-moving, chorale-like passage by the brass. The music and staging were gorgeous. Act 3 opened with the appearance of soprano Shaoting Huang as the Dew Fairy. Carruthers (Gretel) sang an engaging aria to the birds and awakened Hansel. Later, soprano Briana Pudsell was vocally excellent as the Witch, and her acting was exceptional. The transitions continued seamlessly between scenes as the plot moved inexorably to the Witch’s demise and final family reunion. At the end, Brennan joyfully reprised the tra-la-las and the full orchestra closed with the soothing chorale. Published on ClevelandClassical.com March 15, 2018.